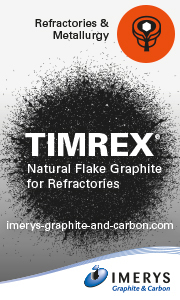 Imerys for Foundry Applications supplies the foundry industry with high performance minerals and innovative solutions for investment casting, sand casting, core-making as well as refractory fillers for the production of foundry coatings. 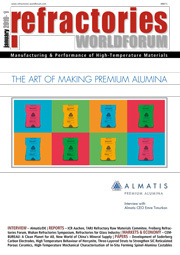 Dalmia-OCL, the refractories business of Dalmia Bharat Group, announced end of January 2019 its expansion into Europe with its first-ever international acquisition, of GSB Group GmbH – a German specialty refractory maker and a global leader in lance production, essential for good quality and clean steel production. Tuesday, 25 June 2019, on the 1st day of the fair GIFA–METEC–THERMPROCESS–NEWCAST at the Düsseldorf Exhibition Grounds, CCD East, in Dusseldorf/DE, the German Association of Refractory and Chimney Engineering (Deutsche Gesellschaft Feuerfest- und Schornsteinbau – dgfs) organizes the Conference Refractory and Chimney Engineering. Capability, efficiency, durability, and service are the values that the German company STEULER sums up for its linings under the term performance. To live up to this claim, the company directs its focus on the continuous further development of the refractory products and portfolio it offers while, at the same time, keeping an eye on improving its customers’ production processes and products. Let’s overtake time. Visit RHI Magnesita at one of the world's largest metallurgic trade fairs from 25 to 29 June in Dusseldorf/DE and experience how we take you into the future. Alteo/FR announced in February 2019 the opening of a new office in Mumbai/IN. The office Alteo India Alumina Private Ltd. will strenghten the regional customer service by ensuring commercial proximity, consistency and reliabilty of supply, as well technical support as was stated in the companies announcement. With 2000 exhibitors and around 78 000 metalworking professionals expected to attend from around the world, Düsseldorf/DE will once again become a hotspot for foundry and metalwork technology from 25 to 29 June 2019. Under the slogan “The Bright World of Metals”, the trade fair quartet, comprising GIFA, NEWCAST, METEC and THERMPROCESS, covers the entire spectrum both in-depth and with a wide scope, ranging from foundry technology, casting products, metallurgy and thermal processing technology. About 25 % of the final energy demand in Germany is accounted for by process heat and cooling. One key to improving energy efficiency here is the use of waste heat, which can be significantly improved by thermal storage. In order to accelerate the penetration of its products on China’s battery market, Alteo/FR joins forces with the China-based group Ginet and created in January 2019 the joint venture Alteo-Ginet (Suzhou) Lithium Battery Material Technology. RHI Magnesita to Acquire Kümaş Manyezit A.Ş. As announced previously, RHI Magnesita/AT continues to consider a potential transaction involving Kumas Manyezit Sanayi A.Ş./TR and has entered into an exclusivity agreement with the sellers, Yıldız Holding A.Ş./TR and Gözde Girişim Sermayesi Yatırım Ortaklığı A.Ş./TR.